In my early teens, I went through what I can only describe as a Tolkien phase. I obsessed over the reclusive author of The Lord of the Rings, devouring biographies, essays, poems, short stories, and even the good Professor’s noted treatise on Beowulf—my first foray into the confusing world of literary criticism. When I ran out of books about J.R.R. Tolkien, I began reading books about his colleague C.S. Lewis. Yes, I was a strange child. This should come as absolutely no surprise to anyone who now knows me as a strange adult. It wasn’t until my high school and college years that my literary horizons broadened far beyond Lewis and Tolkien. In those early years, however, there was one more author whose books I loved dearly—a storyteller whose world delighted me as much as any Narnia or Middle-earth. Although this author was British, like Lewis and Tolkien, he was no professor. No, he was a veterinarian. Ladies and gentlemen, I give you a man whose stories of men, women, and animals have charmed me for more than a decade. I give you James Herriot, who penned enchanting tales of creatures great and small. James Alfred Wight, who wrote under the name James Herriot, was a veterinary surgeon who served farmers and residents in England’s Yorkshire Dales. He spent many years treating cattle, sheep, horses, pigs, cats, and dogs. Herriot was a vet in more ways than one: he served in England’s RAF (Royal Air Force) during World War II. His books are slightly fictionalized memoirs, full of real-life experiences tailored for dramatic effect. The life of a vet may not seem interesting, but Herriot’s stories reveal a career of excitement and unpredictability. Have you ever seen a medical drama on television? Have you felt the tension of a tough case, the thrill of a clever cure, or the grief of a death the doctors couldn’t prevent? Imagine all that, but with animals instead of people, farms instead of hospitals, and wry optimism instead of cynical angst. I will always prefer James Herriot to Gregory House. The animals in Herriot’s stories are often as interesting as the people, and the people are plenty interesting. Herriot’s boss (and eventual partner) Siegfried is eccentric, charismatic, short-tempered, and absent-minded. Siegfried’s younger brother Tristan is an unstoppable force of cheerful irresponsibility. Their clients, from tough-as-nails gaffers to delusional old ladies, are a fascinating bunch. The stories themselves range from hilarious to heartbreaking. One day, Herriot holds back laughter as Siegfried cowers beneath the tyrannical bossiness of his secretary. Another day, Herriot holds back tears as a poverty-stricken man loses his dog to cancer. Add a burgeoning romance to the mix, one with enough humor to appease even a cynical reader like me, and Herriot’s stories become something truly special. For someone with no background as an author—Herriot didn’t start writing until the age of fifty—his style is remarkably good. His books have a warmth and sincerity that practically shine through the pages. 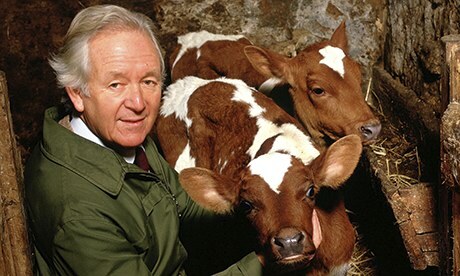 In conclusion, ladies and gentlemen, James Herriot is awesome.